Mobile, Mobile, Mobile – If your website is not available on tablets and smartphones you are missing an estimated 65% of potential restaurant goers. That number skews even higher when adjusted for target demographics and geography. While not strictly a social media issue, your website design and functionality are critical components in your ongoing internet marketing campaign – and needs to work seamlessly with your social media channels. This year it will be critically important that the platform your website is on is responsive to the increasing variety of cellphones and tablets. As far as we’re concerned WordPress is still, hands down, the best website software available. A robust platform that constantly evolves, it is always up to date and, with the use of the proper template, assures you that your site is usable on virtually any device. It also boasts a user friendly interface that makes updating your website pain free – no more getting quotes from your developer for simply updating the logo. So – a stop gap mobile solution such as Duda Mobile is better than none at all – and they have a fairly intuitive site builder if you want to tackle it yourself. However the long term solution is going to be a responsive theme on a WordPress site. Avoid the use of proprietary CMS (Content Management Systems) whenever possible. ROI – It remains that elusive Holy Grail – accurately measuring your investment in time and money versus the return in sales. There are any number of Social Media Metric services which claim to do just this, and some come very close, the problem is they cost money. Which more or less makes them useless, unless your marketing budget is somewhere around that of Taco Bell. However there is a solution in sight. By combing the targeted social advertising mentioned above and using it in conjunction with Google Analytics you can get a fairly accurate gauge on fan conversions – or the number of times a re-tweeter, liker, sharer, ‘grammer, snapshot-teer or troll actually shows up in your restaurant. More on the exact methodology in a future post. In any case start charting the hours per week you, or someone on your staff, spends on social media marketing. Put a number next to it and start thinking in concrete terms of what you’re actually getting for it. Email – While 10% of your fans are seeing your Facebook posts or tweets 80% are still getting your emails. If you have an email list use it for regular newsletters. Email marketing is still a critical component of your promotional campaign and is the best way to reach and convert return customers. 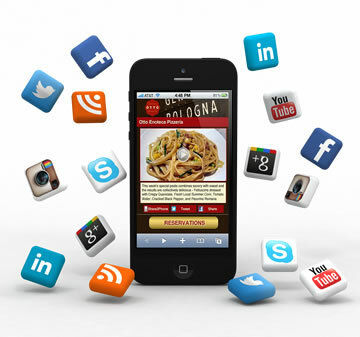 Have a regular program that keeps people up to date on what’s going on in your restaurant. Value Added – It’s more important than ever to post content that doesn’t just say “Eat Here Now”. Engage your customer base with questions about how they like specific dishes, interesting info about menu items or how-to’s from the chef. Your beverage program can also offer great content possibilities with cocktail recipes and wine notes. If all else fails just check the date – with a little help from Google you can always find something provocative that happened on a specific date and relate it to your restaurant. In other words post things that you would want to share with a friend. Local Sourcing – Whether you’re a vegan, gluten-free, free-range advocate, or an all-out steak-craving carnivore the one thing you have in common is that you’re probably interested in where the things on your plate originated. Restaurant goers across the board are asking more questions about where their food comes from, while studies show that as many as 70% of consumers are willing to pay more for locally produced food. To that end it is pretty much a no-brainer that such a pervasive, and growing, trend should be an integral component on all of your social media platforms. Post Facebook updates with links to the local food purveyors that you order from. Tweet and re-tweet info on the same subjects and reference appropriate #hashtags so you can leverage interest in the conversation. Add a Pinterest board with photos pinned from local farms and orchards – post Instagram before and after pictures of produce and meats as they are prepared. In other words engage your customers on a subject of increasing importance – and show yourself leading the discussion, not simply responding to a trend. Google Pages – Google Pages for Business and Google + Pages are still evolving and should be working seamlessly in the near future. At the moment it remains a complicated subject that seems to change weekly (you can find some more detailed info here) and we will be examining it in greater detail in a future post. It is currently being heavily promoted by the company, along with Google Business View virtual tours, which give potential customers a chance to walk through your restaurant online. The key thing is that if and when it coalesces into final form it will be combination of local search results and social engagement. What you need to do now, if you haven’t, is claim the Google Place account for your restaurant (it is almost certain that one already exists), verify your ownership, and then make sure that all the info listed for your store is accurate. Google Place pages are very often the first thing that shows up for a on a search for your restaurant and are directly linked to your Zagat review – here’s an example for Babbo Ristorante in NYC. Here’s a link to their service to get you started. Google Plus has long been perceived as a party that everyone was waiting for someone else to show up to first – it’s time to make sure you’re not the last to arrive. Food Blogs – Food blogs now number in the millions and many more are started every day. They can range from the “what I made for breakfast variety” to the “where I’m eating dinner” strain and at their worst they can be uninformed and even coercive. At their best, however, they can be savvy diners that champion your finest efforts to audiences that can now range up to the tens of thousands. The takeaway here is to make sure you engage the good ones by re-tweeting or linking to their blog posts and contributing value to the symbiotic relationship. It is also good practice to establish an in-house best practices guide for your employees that may be blogging and posting on their own. They can post comments about their favorite dishes – they shouldn’t be using it as a platform to complain about the clientele. Video – Video content is going to be more important than ever this year. Virtually every camera or smartphone has a HD video feature and there are a number of easy to use editors that are available as well (our favorite is iMovie, with WeVideo a comparable app for Android users). Simple subjects such as the preparation of a signature dish or the construction of a special cocktail can be fun and easily captured. Remember – sharing is the name of the game and video is by far the most propagated form of content across any social media channel. (Tip – Audio is difficult to control effectively, especially in the kitchen. A great alternative is Hyperlapse, an Instagram app that creates very cool time lapse videos that are engaging and fun – http://instagram.com/p/yp8_nEuJse.) As Instagram becomes more seamlessly combined with Facebook you can look for more ways to cross promote posts and maximize the value of both. The key here is don’t be afraid to take some chances – you’re not wasting film, the worst that can happen is you just don’t use what you shot. And each time you do channel your inner Scorsese you’ll become that much more adept. In conclusion the most important thing to remember is to be responsive, engaging and flexible – providing your customers and followers with a compelling reason to interact with you. And don’t forget that while all of these network marketing tools are free to use, the value you get for the resources you devote to them is entirely up to you. Have a plan, but be adaptable – be aware of how all of these platforms are evolving into pay-for-play services. Facebook may be free, but so is yelling out the window – and by the end of the year they may both be just as effective as a marketing tool. Stay tuned.